Our world needs joy! Will you join us on a mission to deliver joy, One Jar At A Time? Simply grab a jar and fill it with something that will brighten someone else’s day. Then deliver that jar with a smile and a request for the receiver to pass the jar to another person. It may seem like a small thing to do, but consider the small things that God uses to do mighty things….2 loaves and 5 fish to feed a multitude, not to mention one small boy to deliver that simple lunch. One simple delivery can let another person know that they are loved. Keep it simple! Use the things you have on hand or buy just a little extra of something at the store. Our first deliveries were flowers that were used at an Anniversary celebration rearranged in a Mason Jar and Homemade tea made with blueberries that another friend had shared with us. We’ve even taken old candle jars, cleaned them and filled them with herbs from the patio. A small olive jar was washed and cleaned to be filled with lifesavers and an extra special note that simply said, “you are a lifesaver”. Candy, soup, flowers, cookies, small notes of encouragement, coins, crayons, herbs…anything! You can even just give a jar of peanut butter (we did to soldiers overseas) or a jarred candle (we love 4 Fosters Candle Co. ~every candle has a scripture)! No other reason than that is the vision that was provided as we prayed. And God has been faithful to show us since we stepped out in faith that jars travel well across town, across state, and even overseas. They are plentiful, something we throw away, and come in glass and plastic. One Jar at a time! A simple gesture to share the love of Christ. 1-Fill a jar with anything that will brighten someone’s day. 2-Deliver the jar with love. 3-Ask the receipient to pass the jar onto someone else after they fill it with joy. We will praying for joy to be delivered #onejaratatime ! 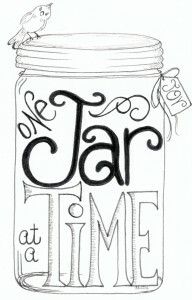 When you join us, take a moment to share your jar using #onejaratatime on your social media networks. Email us your photos and stories to faithfullyfollowing@Hotmail.com. You can even email a request for postcards and labels, just be sure to include your mailing address. May the joy of Christ spread worldwide one person, one simple gesture, one jar at a time.